This map of Asia shows the countries, cities and capitals of the whole continent. The bright colors and bold black font make it one of the most legible political map of Asia. The conterminous European nations are shown in a pale hue to easily display the continental boundaries. Highways are in red, and borders are in pink - making them visible, but not overwhelmingly bold. The country flags are shown in the map legend and the scale is 1:11,000,000. 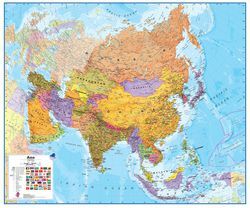 Cover you wall with this large map of Asia. Great for decoration AND learning geography!